We're late starting out on this one, the reasons for which are long and tedious. 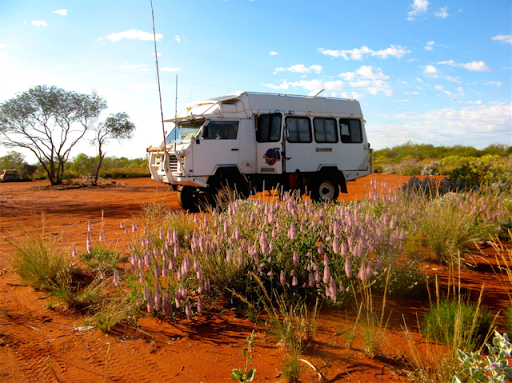 We planned a trip across the Gary Junction Road to the Rudall River National Park (which we completed successfully), however even the longest story starts with the first word, and that word was Bugga! Bugga, Bugga, and thrice Bugga! First there was a wheel wobble problem, followed by frothy gearbox oil, then the leaking of a brand new water tank. But the worst was the violent wheel wobble problem (called the"Death Wobble" in the US) which took 3 weeks including a trip to Melbourne to resolve. The short story is that the swivel pins in the steering were worn such that they were not under sufficient frictional tension, which allowed them to wobble violently at the sight of any small object, like a matchstick. Many days, nights and $$ later, all the parts had been repaired and/or replaced and we no longer have any wobbling. The frothy gearbox oil was a surprise, until I found a breather pipe had been ripped off on our last years desert crossing but didn't notice until after I'd pressure cleaned the underneath of the Oka, allowing water to enter the gearbox and mixing with the oil creating froth. I flushed out the gearbox using diesel fuel three times, refilled it with 80W90 oil and all is now well, although I haven't checked it again recently. Then a brand new flexible water tank, which we bought to replace a previous 10 year old one which had developed a small split in the seam, leaked it's 100 litre contents all over the insides of the Oka on our way to Melbourne to visit our granddaughter (and son/d-in-l). So I had to remove it to confirm a tank leak, not just my pipework, and then negotiate a replacement. I tested the replacement first, being a wise virgin, and that one is now working fine. 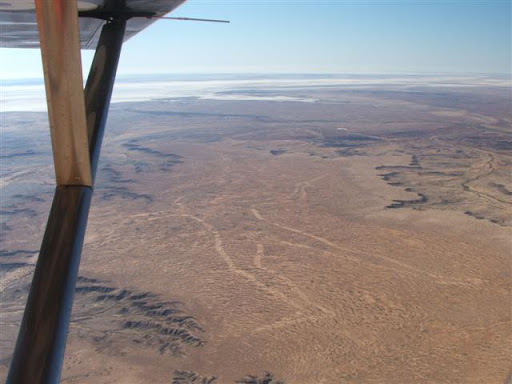 So at last we are on the road to warmer climates, having reached the heady northern latitude of Mambray Creek, just south of Port Augusta. Today, some shopping, fuel and a gas bottle refill in PA and then we're heading up the Oodnadatta Track and some outback travel. 379km today into PA, then via Quorn, Hawker, Parachilna, Leigh Creek, Copley, Lyndhurst to Farina. All bitumen now except the last 30km, which was very smooth gravel. but we actually arrived 15 minutes early. On that basis we’d have overshot Pluto by several light years. 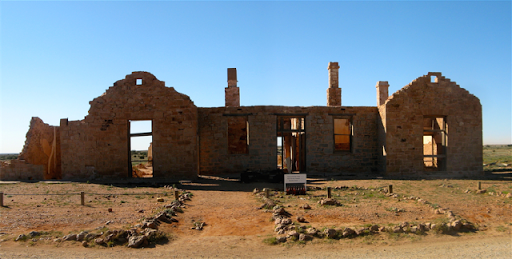 Farina is a ghost town in the far north of SA about 1/2 way between Lyndhurst and Marree. It's off the highway a km or so so unless you know it's there it's easy to miss, but you shouldn't, because it's a nice diversion for an hour or so and now it has a rudimentary signpost. The campground in the creek also makes it a good spot for overnight stay. There are plenty of walks to do and historical locations to visit, like the Afghan Cemetery with graves facing Mecca. The town was established in the 19th century as a potential crop production area after a positive but overly optimistic report by the SA Surveyor-General George Goyder, of Goyder's Line fame. 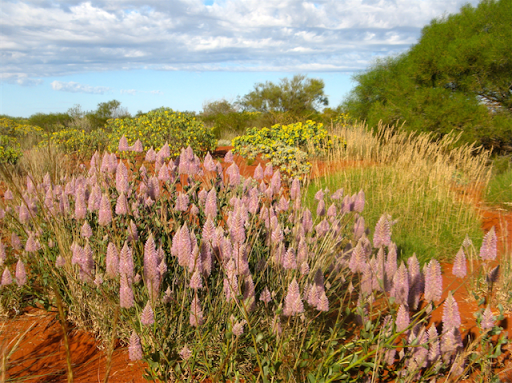 It was intended to have a projected population of around 3000 but it never really succeeded and was finally abandoned in the 1960’s after a century of struggle against a harsh outback existence. 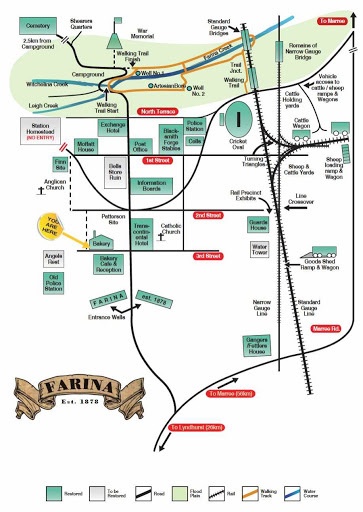 Now Farina is being slowly brought back from a ghost town extinction by the volunteers of the Farina Renovation group. Some shops have/are being renovated (actually just the bakery to date) and lots of signs have been erected, roads have been tidied up and walking trails established. The campground has had a make over as well with a new shower block but retaining the original wood fired donkey engine to provide hot water (which wasn’t on, our fellow campers are a dirty lot), but otherwise it remains a nice quiet, still, grassy, $5 pp creek bed campground with lots of squeaky corellas in the morning. New walking tails have been established around well sites with copious small pergolas with information plaques. 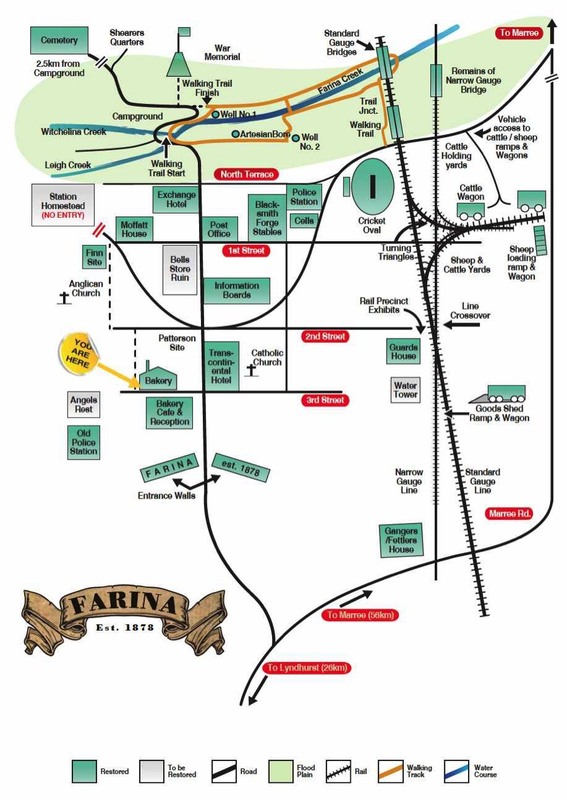 Farina was always living on the very edge of existence fuelled by good rains in the 1850’s which fooled town planners in Adelaide that there was potential for sustainable outback crop production. It was never going to be, despite numerous attempts to sink wells which mostly found salty or no water. Whilst the town site and crop production was abandoned, the surrounding country remains a viable cattle station. Following the Heritage Walking Trail (which all towns have, even it seems a ghost town), we trudged around the several wells and “government” (ha) bores in the Farina area, which were just adequate to sustain interest in the town’s development and separate investors from their money but quite inadequate to sustain life. "Trudged", that is, until the nice little posts with historic electrical insulators on the top which were indicating the route, ran out, leaving us to nimbly backtrack to the campground. Nevertheless, Farina is slowly coming back to life. 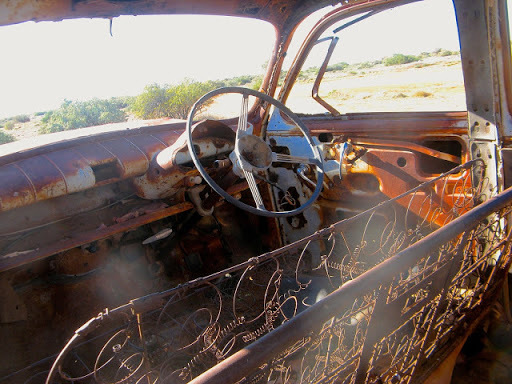 20,000 man or person hours of volunteer work so far is transforming the outback town from an area of crumbling wrecks to something to be wondered over or even admired. The fortitude of the people who lived there, and who still reside in the cemetery, is a testament to the resilience of the time. The slightest hint of an opportunity was enough to galvanise them into action. Try telling that to the youth of today or even the youth of my day. My first car (a 1952 Ford Consul) and our current vehicle at Farina, 40 years age difference but about the same amount of rust. Check out the Farina Renovation Group’s website here. They are always interested in volunteers and donations. 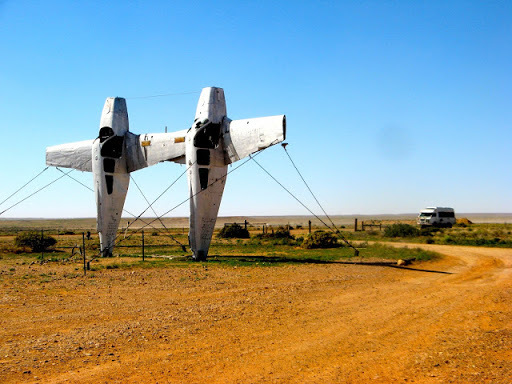 Leaving Farina, around lunchtime, +/- 2 hours, we passed by the Alberrie Station’s “Plane Henge”, an area of weird outback sculptures we first saw about 10 years ago. They’ve deteriorated somewhat since but still show the quirkiness of the originator. Janet checking her watch by the Time Tree which we originally decorated in hanging time pieces. The entrance is marked by twin aircraft welded together, now the residence of a flock of galahs. Nearby there’s also a memorial(?) to the Marree Man, a crop circle type ground sculpture, probably created by bored US service men with a grader and a GPS. It’s fading now but J attempted to maintain its relevance by imitation. When I said only yesterday that we were “on the road to warmer climes”, I did expect it to take more than a day and a half. But no, almost as soon as we left the shopping experience in Port Augusta, the temperatures started to rise. Last night at Farina it was cool but pleasant but today became horrendously windy and, I kid you not, actually hot. The huge high pressure cell which has been centred over southern Australia for the past week or so, yes, the one that brought freezing temperatures to Adelaide and places even souther, is now bringing hot northerly winds, from the north as you might expect, and gale force ones at that. 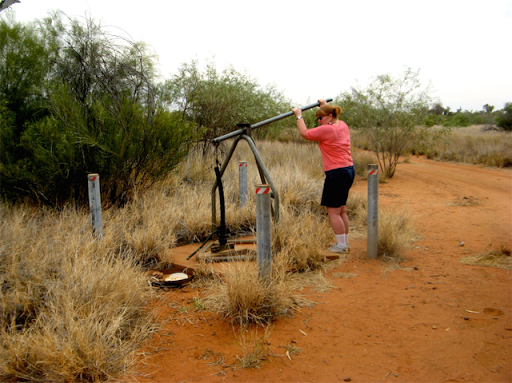 This afternoon on the Oodnadatta Track it reached way over 30º, so warm in fact that we had to break out the shorts and sandals. And J even had to shave her legs just in case we met someone. It almost made me regret not getting our air conditioning regassed before we left Adelaide. I had wisely decided, based on previous experience, that it wouldn’t get warm until way into the tropics and I could leave such maintenance activities until we reached the Alice. 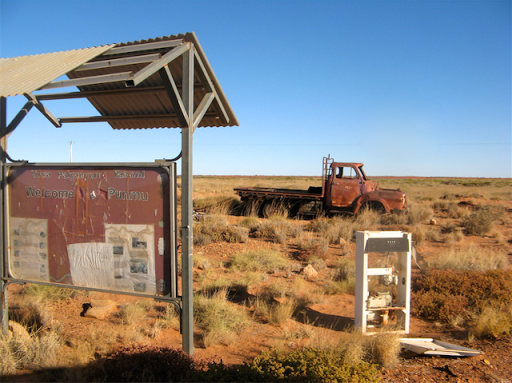 But Tony Abbot has got his way and global warming really is just a myth, except on the Oodnadatta Track. 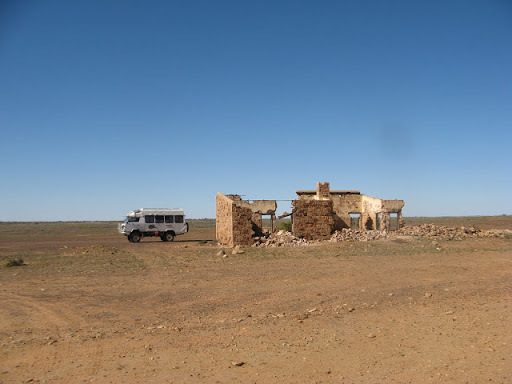 We battled head and and side winds all day across barren plains and past long abandoned fettlers cottages along the old Ghan line to reach Beresford Siding to camp for the night. Nothing here except the ghosts of railways past, a rusting water tower, iron roofing sheets banging in the wind and lengths of old railway line waiting to trip us up if we need to go outside during the night. But here we are, happy hour glass in hand, waiting for the cook to create beef rogan josh curry and rice. For those given to counting the glasses, I think it’s about 5 so far. Luckily, of the 26 litres of wine, port and sherry bought from Dan Murphy’s while there was still one nearby, we still have 25 or so left, not including the block of 30 beers of course. We could last upwards of a month at this rate. Up early from the warm night to a cold windy morning. The aforementioned high pressure cell has been replaced by a cold front, and not just mine. So just what you need in a cold gale is a broken down vehicle to assist. 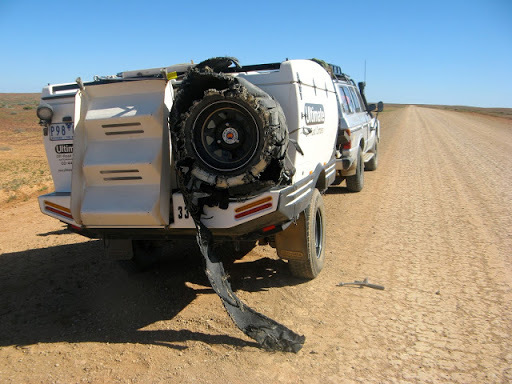 Soon after setting off from a William Creek comfort stop we encountered N and L in their LandCruiser towing an Ultimate Camper Trailer, which had shed a tyre. Shred would be a better word for it. Badly shredded, delaminated and wound around the axle would describe it best. 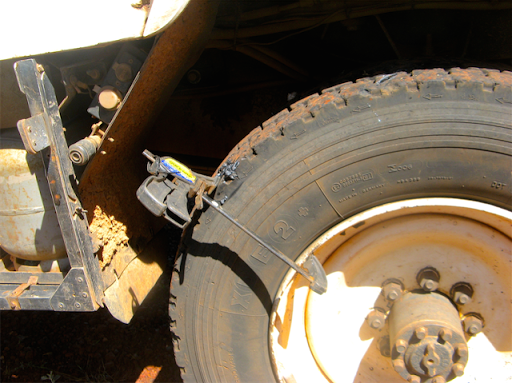 The tread had become detached from the sidewall of a trailer tyre, been run over by its own rim and wound itself tightly around the brake drum a couple of times like a scrunchy. That tightened on the brake cable causing the trailer brakes to turn fully on, jamming the wheel and dragging them to a stop. The brake preventing the wheel from turning (which is exactly what they’re supposed to do) but the tyre tread around the brake drum prevented the wheel from being removed from the hub. The rescued wheel and trail of tread. “I think you need some assistance” I ventured. As it turned out we needed about 9 people, who progressively stopped to help, to force the wheel backwards to release the tension, cut the tyre across the tread with knives, tin snips, swear words etc, manoeuvre the recalcitrant tread from around the rim and detach the wheel from the hub with its attached trail of tread. While we were doing this, Janet entertained L in the back of our Oka, out of the biting wind. That was never going to be a one person job. However, we successfully made it after an hour of struggling, against the cold as much as the sharp cords of the tyre, and got the spare fitted. Luckily there was no damage to the hub or trailer body. 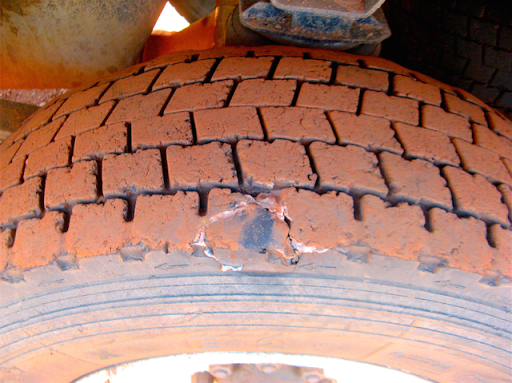 They had probably picked up a slow puncture which flattened the tyre leading to the complete failure of the sidewall. Trailers are prone to doing that, we’ve helped several in a similar state since you can’t see/feel what’s happening until after it’s happened. We followed them up the track for 50km or so, to ensure no further problems and waved them on their way to find another spare tyre. 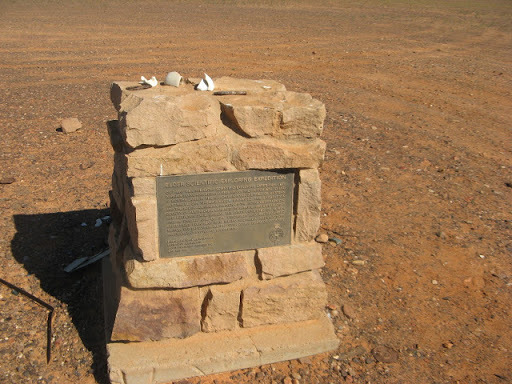 Then, suddenly it was lunchtime at Warinna Siding, which happened to be the exact spot that Sir Thomas Elder dispatched an expedition across Australia in 1891. 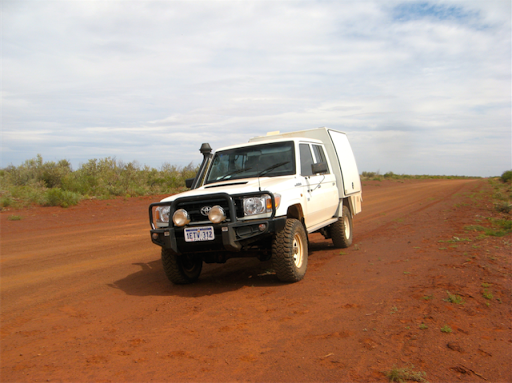 With 14 people and 44 camels, as you do, they surveyed vast swathes of lower western Australia from South Australia to the Murchison River district in WA, in what was one of the more successful examples of exploration, exactly 6886km in 12 months, without a GPS. The team was led by surveyor David Lindsay (Elder wasn't actually on the expedition, he only paid for it all) but I don’t recall him being rewarded by the naming of any substantial feature, river, mountain, swamp etc. after him. Sad really, considering that notable failures such as Burke (of Burke and Wills infamy) have all sorts of things named after him, towns, books, dig trees etc. 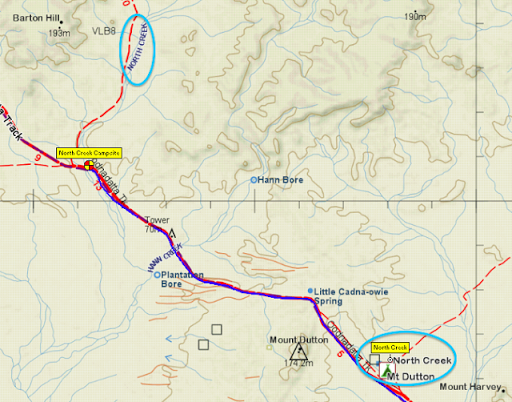 Tonight we are camped at North Creek, eventually, since I incorrectly located a waypoint on the “North Creek” camping icon clearly marked on the map near Mt Dutton. Silly mistake I suppose, I should have known that there were 2 of them, the real North Creek and campsite was 30km up the track. I shall have words with the map maker regarding the domestic dispute that ensued: pilot to navigator: “You’re useless”, “No, you’re useless”, “Shut up”, ”No, you shut up”. 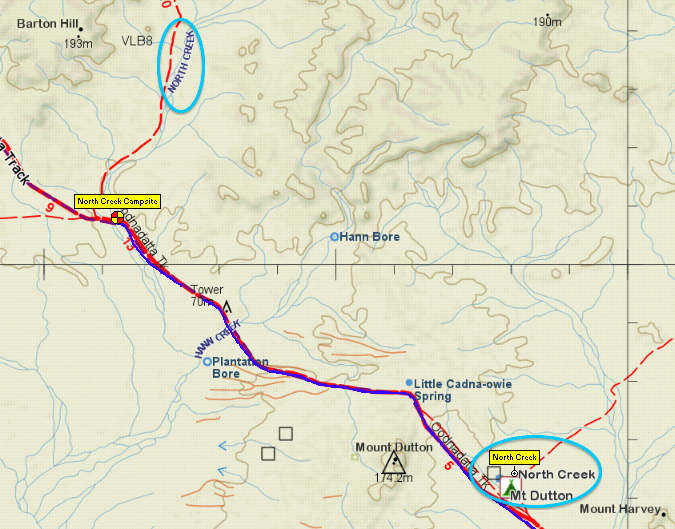 Two North Creeks in 30km? Just arrive in Marla after 800km of gravel road and our first internet for several days. Whooppee!! 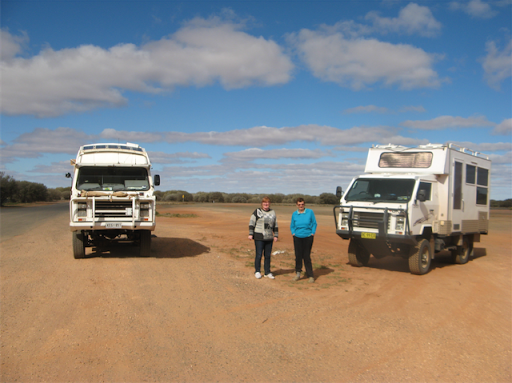 Today’s 290km took us up the rest of the Oodnadatta Track, and through the megalopolis of Oodnadatta. The Pink Roadhouse is still there, although looking decidedly faded, and a new general store has arisen just beyond the town boundary, but none of these plentiful attractions caused us to slow down, apart from the 50kph speed limit, let alone actually stop. 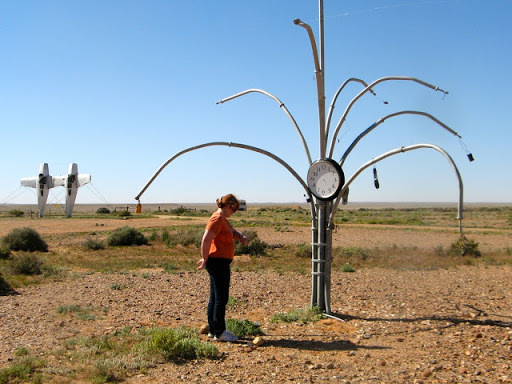 Since the last train passed through on the Old Ghan line in 1986, Oodnadatta has hung on as a watering and supply point for persons travelling across the Simpson Desert (which we haven’t) or the Old Andado Track to Alice Springs (which we’ve done twice). Although after a panic attack last night in which I foresaw the potential need for the services of a health professional, it was gratifying to note the existence of a substantial Health Care Centre in the town. 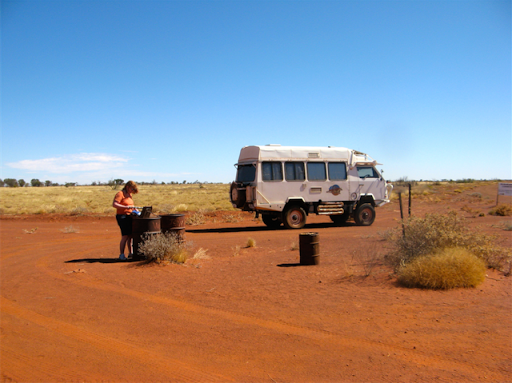 Only 200km and 2 million corrugations later we reached Marla and no sooner had I established Telstra communications and read (actually discarded) about 17 emails, and started updating our blog, when the sound of another Oka engine pummelled my ears. Tim and Lorraine in Oka 124 had sidled up next to us and we spent the next couple of hours discussing world events and who had done what and where, with and to their Okas. We seldom see other Okas on our trips so this was a welcome opportunity to share experiences over a cup of tea/coffee (sadly it was too early for happy hour). T and L come from Tambo in NSW and are on their inaugural around/across Australia trip in their Oka. 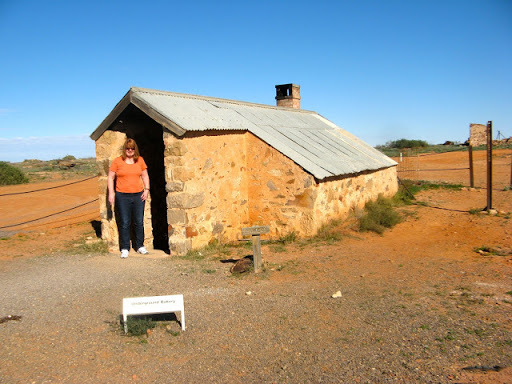 The result was that I didn’t get to complete the blog edit before we had to move on north up the track towards the NT and out of Telstra range, and T and L had to leave south for Coober Pedy. After an evening watching huge road trains rolling past the rest area, all lit up with rows of side lights, this morning we continued up the Stuart Highway and into the NT, where suddenly it was no warmer than SA. A clear blue sky and therefore full-on sun greeted us a Kulgera and followed us to Erldunda where internet service was reestablished and emus were counted (more than 20). 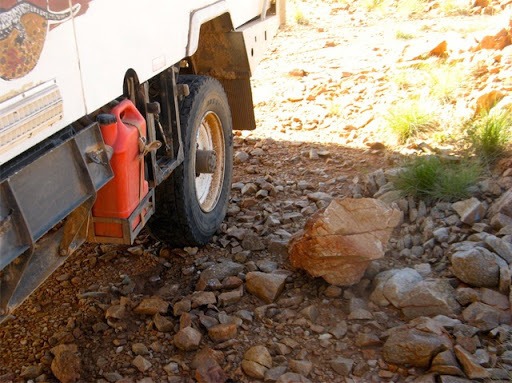 A splash of fuel, the first since Port Augusta 1000 km ago, and we headed up to Owen Springs Reserve, 60km south of Alice Springs, to camp by Redbank Waterhole, complete in every way except for no water in the hole. 1679 km in 6 days so far, +/- a couple of inches, mostly against strong headwinds. 6.3 km/l or 15.9 l/100km for a 6 tonne vehicle. $1.30/l in Adelaide, $1.87/l in the southern NT and $1.42 in Alice Springs. Today's 390km of the Stuart Highway was so interesting that I can recall nothing whatsoever about it. Arrive in Alice after a freezing night when a jumper and 2 pairs of socks were barely enough. Did initial desperation shopping, the washing, hair cut for Janet and I bought a couple of expensive $7 shirts in Kmart to replace those someone forgot to pack, but having to pay 50ç for spending a penny is a bit rich. 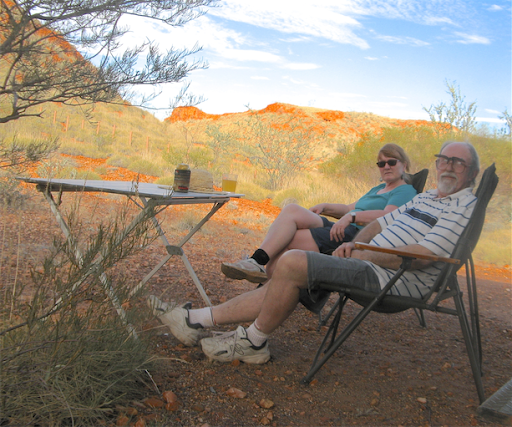 Camping on an area of scrub land just south of Alice Springs where the Finke Desert Races are held. We got bogged there once but not this year, it’s very dry and dusty. Up early in the extreme cold, ice on the windscreen etc, to get our air-conditioning re-gassed. 0º is the perfect conditions for such an event, but it will warm up so we needed it done while we can. Then more real shopping, food, fuel, water. Back at our campsite I refixed the leaking water tank, yes, the one I’d first fixed before leaving home. I had replaced the tank with another identical item, I thought, but in 10 years, the French manufacturer had slightly changed the thread on the filler cap so the old one didn’t quite fit the new one and leaked a bit (actually a lot). So I replaced the old filler cap with the new one and all is OK again. I tested it properly this time by pumping water into it from another tank, but it did make a bit of mess during the process. Then, Oh Joy of Joys, the cricket is on again. With every expectation of a strong Aussie comeback, I connected up the TV module to my computer and tuned into Imparja TV which is showing the Channel 9 telecast in the NT. Joy soon turned to despair as wicket after wicket tumbled and it was left to our fast bowlers to push us past 50 in the shortest test innings on record. No matter I said, full of optimism still, the English will now face the same pitch conditions as the Aussies and we’ll show them. And show them we did, just how mediocre it was possible for a professional cricket team to become. I retired a dejected soul. Another very cold night, not helped by the cricket score, -1º but a warm sunny day, in fact 3 cloudless days in a row so far, but nowhere near our record of 44 consecutive cloudless days in 2012. Re the cricket, at least this morning’s social media provided some good smiles (“The English team has successfully avoided the follow-on”, “At least the run rate was good” etc), but with dual English/Aussie nationalities, I was sorely tempted to do a Syria and change sides, something I have never contemplated before and won’t be doing now either. After a final top up of fuel and water so we have all our tanks fully full (270l of fuel and 250l of water) plus a refilled gas bottle, we waddled out of Alice Springs along Larapinta Drive through the West Macdonnells, which is a very scenic drive. We stopped for lunch at a very scenic lookout when we were set upon by a swarm of bees intent on carrying off our lunch. Whether they were the bitey kind or not we didn’t want to find out but they were a lot smarter than flies and managed to squeeze through small openings. We quickly closed all the doors and windows and ejected those that made it through the fly screens and moved on. Scenic, yes, dangerous, also yes. 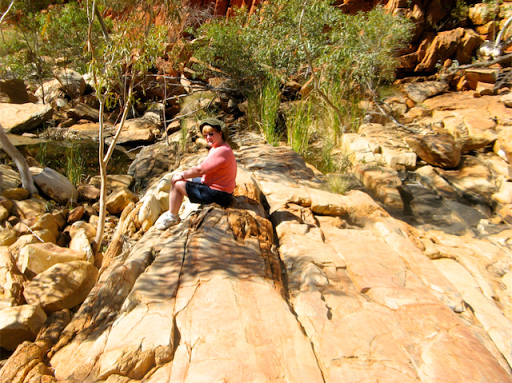 Camped at Redbank Gorge, the most westerly gorge in the Macdonnells, and did a walk into the gorge. 20mins each way was the promise but it took us a good hour and a half for the round trip and was quite demanding, scrambling over rocks like a pair of teenagers who had spent too much time in front of the tele. Had our photos taken by a kind Japanese family, and when I slowly asked where they were from in my clearest Aussie accent, she said “Perth”. We were quite hot when we returned from our scrambling and had to reduce our stocks of beer and cider somewhat to compensate. 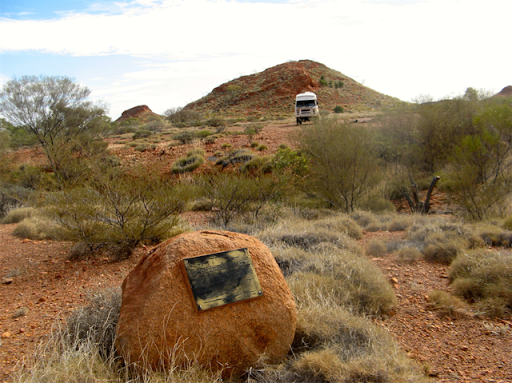 The bitumen now lasts along Larapinta Drive as far as the Tylers Pass turn off which connects up with the Mareenie Loop Road via Gosses Bluff meteorite crater as a nice long (540km) trek from Alice Springs to Watarrka (Kings Canyon) and Uluru (Ayers Rock) . 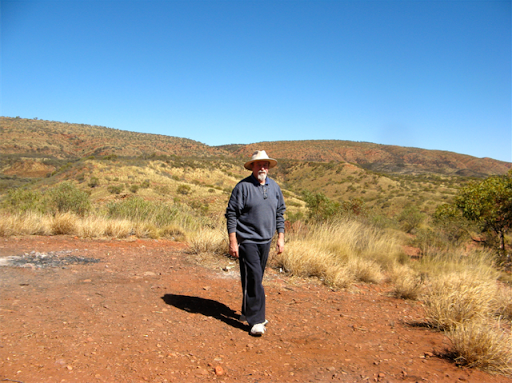 We however turned the other way, north towards Haasts Bluff and Papunya. This is a rocky rough track but fortunately only 100km or so. 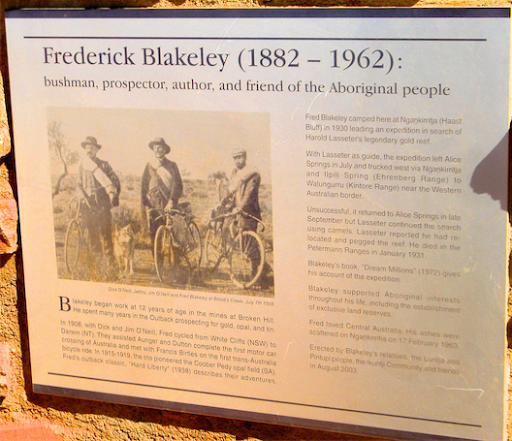 Near Haast’s Bluff is a memorial to Frederick Blakeley, explorer and friend to aboriginals, whose main claims to fame were his ill fated attempt to find Lassiters Reef and his passion for riding across Australia on a bicycle. 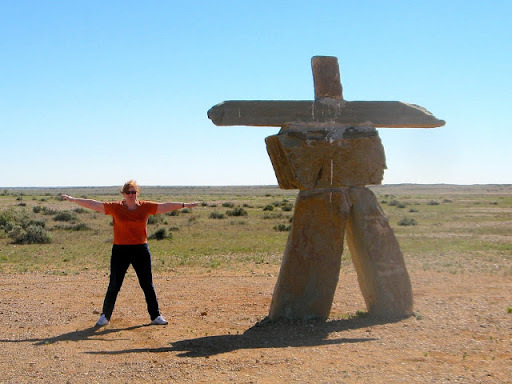 Just a bit further on we crossed the Tropic of Capricorn. No signs, but I swear it felt warmer as soon as we crossed into the tropics so I checked the thermometer, 23.5º, and the latitude of the tropic?, 23.5º. How likely is that? Actually very likely. Every time Adelaide’s temperature reaches 34.9º, it’s the same as its latitude. Luckily it never quite reaches its longitude. As the day wore on, the temperature rose steadily to 27º, and time to check our new air conditioning. The compressor and the front fans turned on OK but the rear/overhead fans didn’t. Bugga, so we stopped and I checked the fuses and the associated relays, which I swapped around, and all was then working and cooling things down well, just dirty contacts. So our Alice Springs investment in Thursday morning’s 0º has paid off. Papunya, a medium sized Aboriginal town, is laid out from above as a series of neat interconnecting circles, but at ground level it’s a fairly grubby settlement which is hard to find your way out of. You have to turn right at the basketball court down a dusty track which is actually the main road west to Kintore, although there are no signs to say so. Fortunately our moving map navigation system showed us the way. 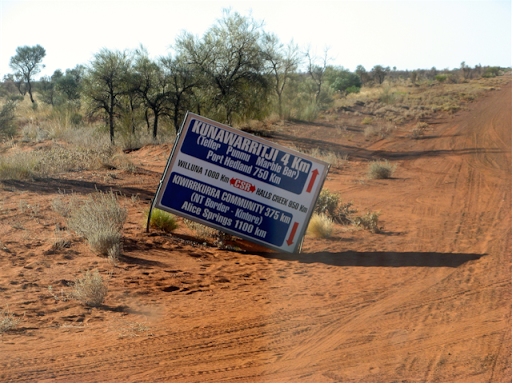 The Kintore Road (also know as the Gary Junction Road) was constructed by Len Beadell in the 1960’s as one of the access tracks for the British/Australian atomic weapons test program. Hard to believe that any government would allow atomic testing to be carried out on the Australian mainland, but those were different times with different priorities. Anyhow, the Kintore/Gary Junction Road thus far is quite a smooth outback track with the occasional sandy dips to catch out the unwary. We passed by the most impressive hills of Mt Liebig and the small settlement of Illili, which looks on the map more like a bar code than the name of a location (and not to be confused with Illpili further down the track). We are camped tonight behind one of Len Beadell’s plaques which he placed at regular intervals as he constructed his network of tracks in the 1950’s and 60’s. I’m a worry wart, I worry about fuel consumption, tyre wear, which shirt to wear etc. and today was no exception, except to those we added the adverse state of the track, whether we should have come this way at all, what if something breaks etc. 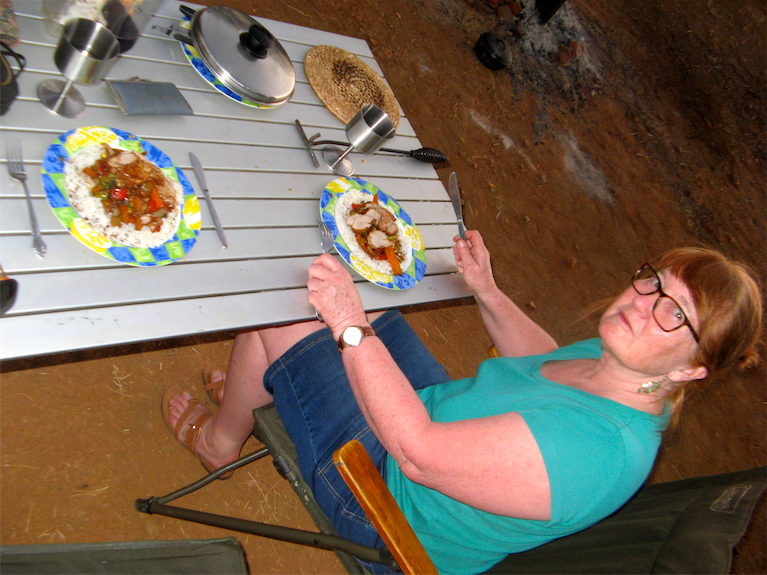 But here we are nearly 200km from the nearest community having a nice campfire, a drink in the warm evening sun and excellent meal of pork fillet in a ginger sauce on a bed of rice and stir fried veggies. How could it be better than that? We left our Beadell Plaque campsite heading west towards Kintore, and the top of the Sandy Blight Road (which we did a few years ago). The track started off quite smooth but as soon as we passed a “Grader Ahead” sign, things got worse, corrugated, rocky and rough. Our speed dropped from 60 to 30kph while my frustration level increased from medium to high. The temperature did likewise rising to 28º so it was back to shorts, tee shirts and aircon for the afternoon. 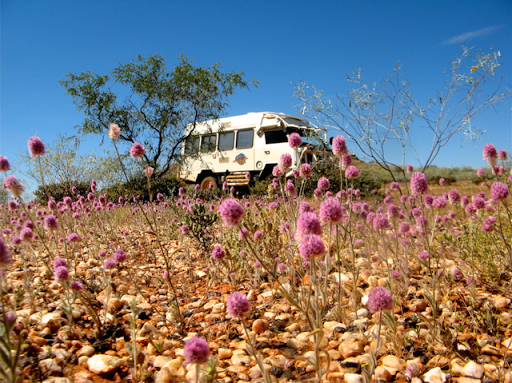 We crossed the NT-WA border and into the welcoming arms of the Shire of East Pilbara without the usual quarantine kerfuffle, but suddenly the track stayed much the same. We did see our first camel today, a fairly scruffy beast who was still learning the road rules, and termite mounds have started to emerge. After 237km today, we reached Mt Tietkens (543m), a very pretty hill just 10km inside WA, with an excellent (and deserted) camping area at its feet. Even though it was now only just after breakfast in WA time, we decided to stop here for the night. We made use of firewood someone else had collected yesterday to construct an adequate fire to burn our rubbish and roast the pork, although it could so easily have been the other way around. Nearby someone had constructed the world’s shortest walking trail. 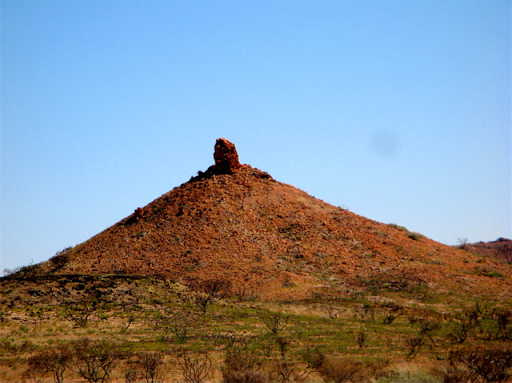 It starts with a near vertical incline up 6 steps cut in the hillside, followed by a steep 1/2 metre decline for a couple of metres, a sharp left turn and a 2m rise to the nearby termite mound summit. All of 4.5 metres total distance. And by the way this has been our 6th consecutive cloud free day. This is one of those places where you don’t need to dig a hole, the dingoes will only dig it up again overnight and feast on truffles. 10 August 2015, would be my mum’s 104th birthday today. Being a nice warm day and we were standing on a good firm base of solid rocks, I decided to change a wheel. One tyre which is s bit worn, has become badly chipped up on the rocky track surface and before it fails, I’d rather like to change it so we still have 2 useable spares, rather than 1 1/2. And so I did, took about 45mins of back breaking work but all went OK.
Several interesting low ranges of hills today, we lunched at the Pollock Hills, but we could have chosen the Dovers Hills or Mt Webb. Started the sand dune section mid afternoon, some sandy sections quite difficult. Plenty of fresh water here so we’re staying for a couple of days to do washing etc. and recuperate from 800km of gravel tracks from Alice Springs. Did a walk round of the other 3 vehicles camped here to make their acquaintance and have a friendly chat. All going the other way so we gave them our track info and vice versa. Had a nice evening outside and cooked chicken à la veggies on the outside BBQ. Feel much better today after bacon, eggs, tomatoes, fried potatoes and toast for breakfast. Then I fixed the rear side door mechanism which prevented the door from remaining shut, which is a bit of a show stopper. Had to take the door mechanism apart, de-grime the and re-lubricate the sliding plates. All OK now. With a fine warm dry breeze blowing it was only sensible that we did the washing. Here’s a view of our beautiful (and free) shady campsite covered wall to wall in drooping desert oaks, from the socks drying on the left, across to the toilet tent on the far right. Doesn’t look like we are 100’s of kms from the nearest town does it? 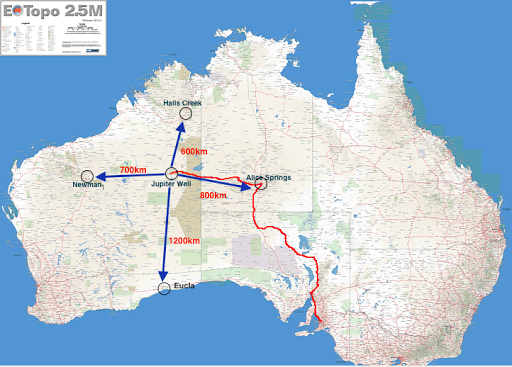 (Newman 700km west, Alice Springs 800km east, Halls Creek 600km north (only via the CSR), nothing much at all south, no tracks and even Eucla has a population of only 11). After lunch we walked to the site of the original Jupiter Well, dug in 1961 at the same time, but not directly related to Len Beadell’s development of the GJR, and named after the planet whose reflection was seen on the surface of the newly created well. Nothing much to be seen of the original well after 54 years (there is supposed to be a blazed tree and plaque), and the current bore was sunk in 1985. 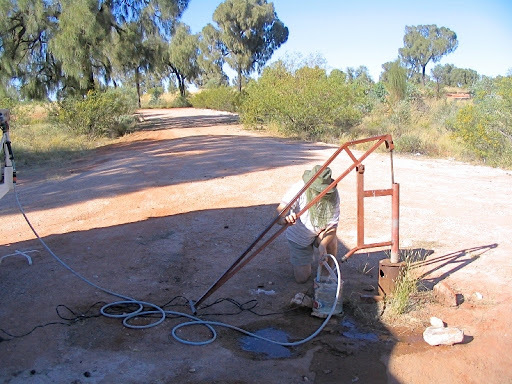 The interesting history of the development of Jupiter Well (as part of the geodetic survey of Australia) and why 2 wells were dug, can be read here. 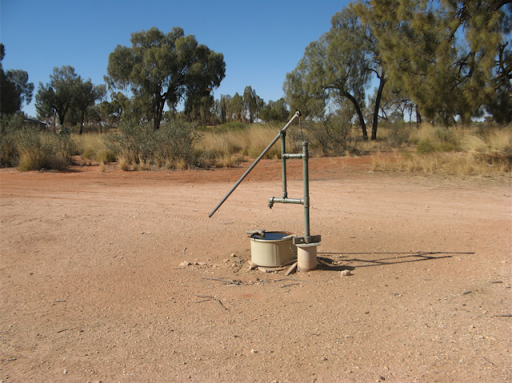 Although we only walked a few 100m from our campsite to the original well site, it was strangely worrying, being so remote, hot, dry and alone, and it was only 25º today. Alfred Gibson got stranded alone in this desert in 1874 and was never seen again. A horrendous fate to contemplate. Alfred Gibson, in whose desert we are travelling, got stranded alone in this desert in 1874 on an expedition organised by Ernest Giles and was never seen again. He was only 23. A horrendous fate to contemplate. 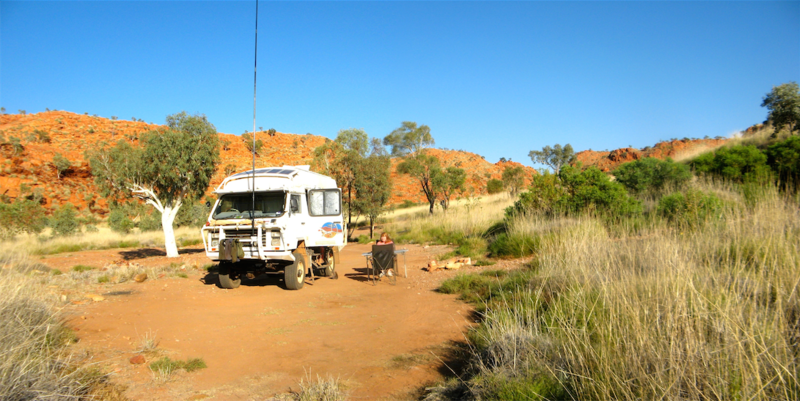 There are 3 other vehicles camped here so we organised a happy hour this afternoon with all their occupants (Terry, a Kiwi, Tony and Lee-Ann, Graeme and Elaine, sister of Tony) to swap anecdotes about outback travel. It’s surprising just how much clutter you can distribute in one’s day’s camping. We had stayed for an extra day at Jupiter well to relax and do the washing (mutual opposites?) and we sat outside for most of the day. So there were chairs, a table, stubby coolers, drinks, camping lights, toilet-tent/loo etc, rubber door mats to combat dust, washing line, BBQ cooker and spade, all of which had to be reinstalled in their correct locations before we could drive over to the water pump to replenish our supplies. Despite all that, due to the weird WA timezone, we were still on the road by 9.00am. My internals have not yet adjusted to getting up with the sun at 6 am but not having lunch until 12.30. 155km later, we had said lunch at Gary Junction, a 3 way track junction which gives the Gary Junction Road (GJR) its name (Gary was Len Beadell’s son). 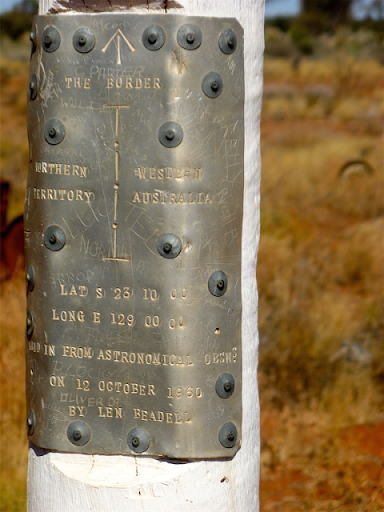 The junction marks the end or start, depending on your orientation, of the GJR, the Jenkins Track which leads to the Canning Stock Route, and the Gary Highway which leads south past Windy Corner and ultimately to the Gunbarrel Highway, Len Beadell’s best known outback track. 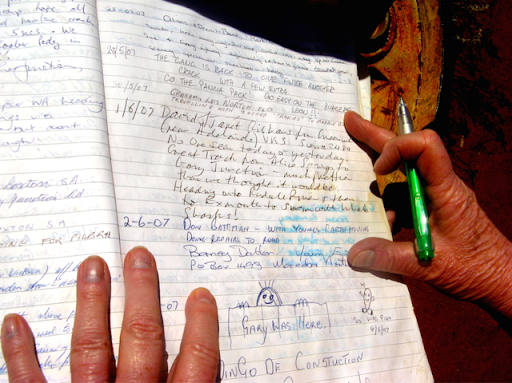 Oil drums and a visitors book mark the middle of the 3 way junction. We saw no one all day. 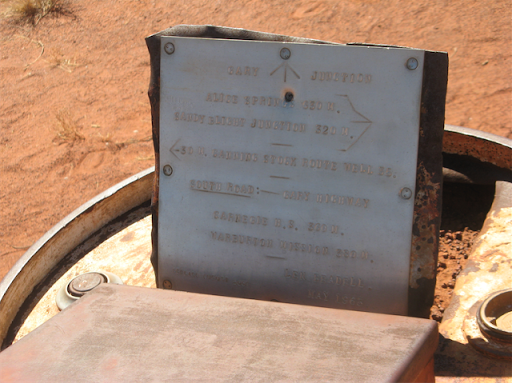 The plaque placed by Len Beadell on the turned up top of an oil drum. He used his revolver to drill the screw holes. We’ve been this way before and at the junction there are a couple of oil drums, one of which contains a visitor’s book in a steel enclosure into which travellers write their life stories, or a cheery one-liner for others to never read. We are no exception and when we looked back through the dusty, faded exercise books, there was our 2007 inscription, still looking like I wrote it yesterday, untidy, grammatically obnoxious but factually correct. We added our current Hello’s, and not being able to think of anything both witty and family friendly, took some photos to compare with our last visit and motored on. In doing so I inadvertently drove over a bolt sticking up out of the road, probably the remnants of a trig marker point. Luckily I went right over it, so the main tread of the rear tyre took all the force, not the side wall, and 60km later all seems well. On a previous visit we travelled down the Gary Highway and saw no one in 5 days and 800km until we reached Warburton on the Great Central Road (not one of Len Beadell’s tracks). When I researched the Gary Highway on our return I discovered that there was no Wikipedia entry for the Gary Highway, so I wrote one and you can still see it here. 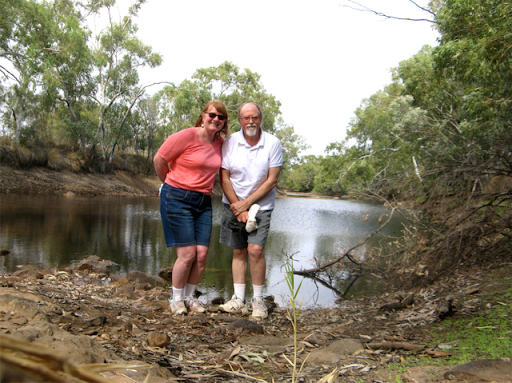 There’s a photo in it I took of our Oka and Janet in her blue shirt at Veevers Meteorite Crater part way down. I mention this because someone else tried to claim ownership of my photo until I complained to Google who graciously reversed the credit. Google does have a soul after all, albeit a small one. 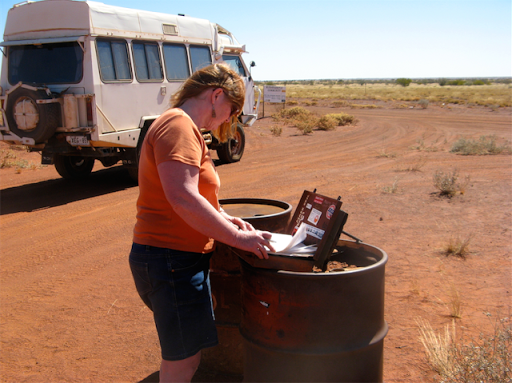 Later in the afternoon, we reached the Canning Stock Route (CSR) at Well 33, 1076km from Alice Springs and we still have 70l of fuel left. We’ve done up and down the CSR before but this time we are heading straight across it. 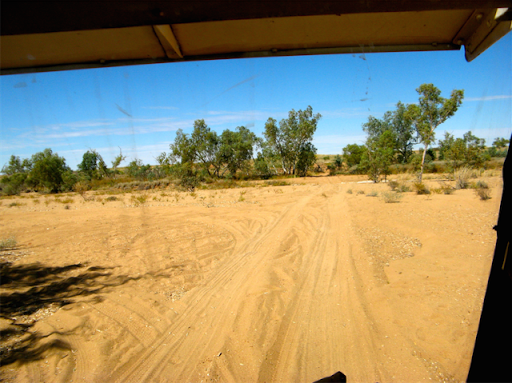 The CSR is the world’s longest 4WD track, over 2000km across thousands of difficult sand dunes and is Not Easy. Many vehicles have succumbed to its risks and I didn’t want to add to that total. We have now moved from the Gibson Desert to the Great Sandy Desert, although I failed to notice the join, and tomorrow we’ll fuel up at Kunawarritji Community and head for the Telfer Gold Mine where we can turn south to the Rudall River National Park (now renamed the Karlamilyi NP). 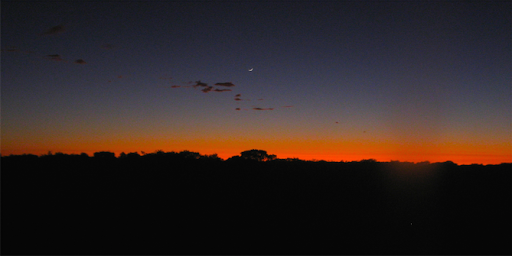 Had a good day today, starting with a spectacular sun and moonrise out of our rear window across the desert. But then there was a sad moment. We were camped at Well 33 last night with several other vehicles on a Tag-Along-Tour half way down their 3 week trip on the CSR. Sadly one lady’s mother has just died, so she and her husband have had to abandon their trip, set off alone 1200km east to Alice Springs, the nearest large airport and a 3 or 4 day drive on the same track we just came on, to catch a plane to Brisbane. This would have upset the other members of their party as well. One of the problems of being a remote location is that despite the advances in communications, the tyranny of distance remains the same. We know the feeling. Anyway, after breakfast (when we had ice cubes in our milk since I forgot to turn the fridge down last night), we filled with delicious well water, refuelled with 160l of diesel at Kunawarritji Community store (at $3.40/l) and bought some groceries from their sparsely stocked shelves. The total bill was over $500, but this is a very remote location so the prices are very understandable and the local people are very nice and friendly. And it’s good fun watching the dollars ticking up on the fuel pump, like a poker machine. We set off up the track towards Punmu, a small aboriginal settlement 185km west, just inside the Rudall River National Park. When we stopped for lunch I put some rubber mats down under the engine to repair a wire to the compressor which got ripped off somewhere along the way. Not a long or difficult job but it prevented my compressed air compressor from working. We had seen no one before or since on this track but in the 5 minutes I was fixing the problem, 3 vehicles stopped to render assistance, all of them friendly local aboriginals. One of them even offered me a beer to help my work which is very unusual. He had a smashed windscreen which he said happened this morning when a bush turkey (bustard) flew up and hit it. We crossed Lake Auld, a dry salt lake with a good mirage hiding the opposite shore and on through very scenic sand dune country. It was the former site of a road or mine construction team. 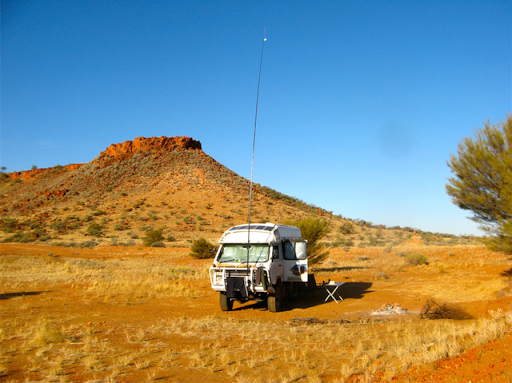 I logged in on our HF radio to Adelaide Base, more than 2200km away as the emu flies, to tell them our location, travel plans and state of well being and got a 3 out of 5 signal reading, pretty good for such long distance communications. When there’s no one around for 100’s km, it’s comforting to be in regular contact with the human race and who can help when needed. 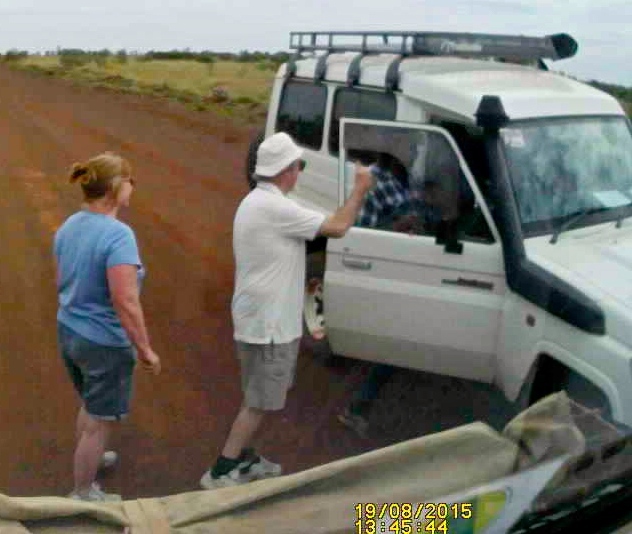 The other morning a vehicle broke down (no engine oil) on the Barkly Highway in eastern NT and the VKS network organised assistance from a motoring organisation. Our 11th sunny day and another good day. It was only 10km or so from our snappy gum campsite to Lake Dora. 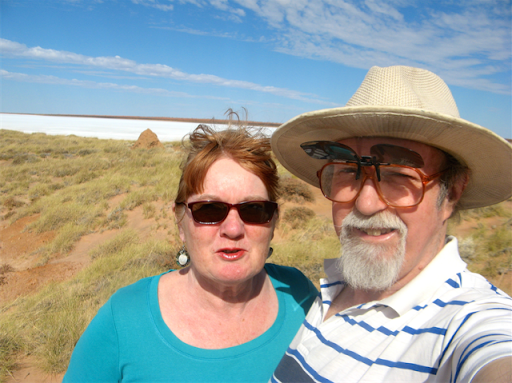 This is a dazzling salt lake into which the Rudall River flows, when it has water in it. 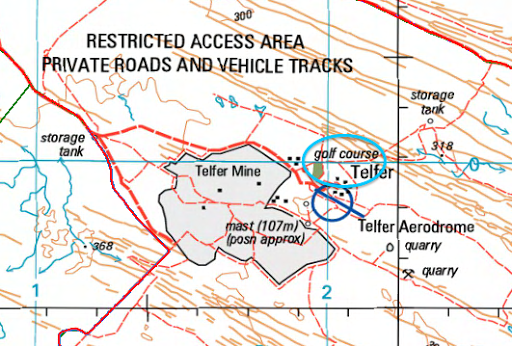 From there the NP access track is a 100km further on past the Telfer Gold mine. 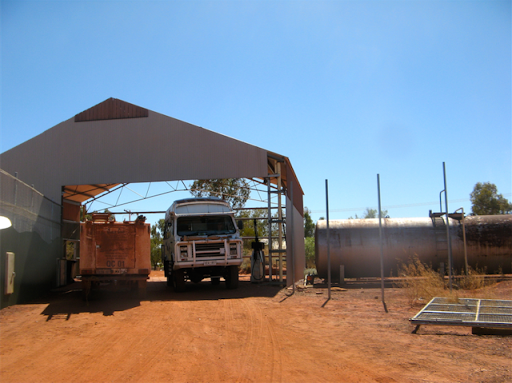 Owned by Newcrest Mining (if you listen to the resources sector of the daily business news) the Telfer Gold Mine is one of the largest in the world and tucked away in a remote corner of WA’s Great Sandy Desert so it’s very difficult to access. The spoil heaps are visible from 50km away and the size of the mine can be imagined from the “Golf Course” which is shown on the survey maps. Being in the desert, we can only wonder what colour the greens really are. 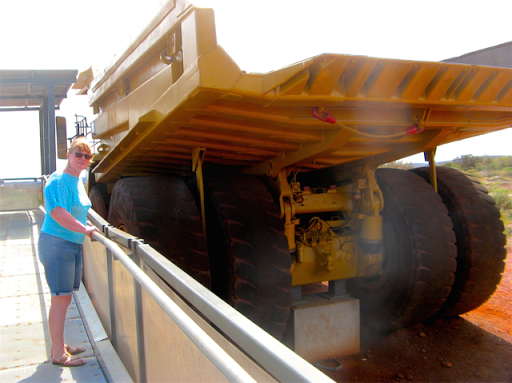 It worried us somewhat when we encountered a large “No Entry Without Prior Approval” sign but we had no option but to drive up their huge mine track anyway and plead ignorance when necessary. Fortunately the tourist police were busy counting their nuggets today so there were no checks on vehicles and we drove past the main entrance and on to the Rudall River access track. We passed through the very scenically named Karakutakati Range of hills on a very rough and slow track to Christmas Pool which I had heard of but knew nothing about. Stand by for a history lesson! No water in Christmas Pool, it’s just sand. And it's not Christmas! 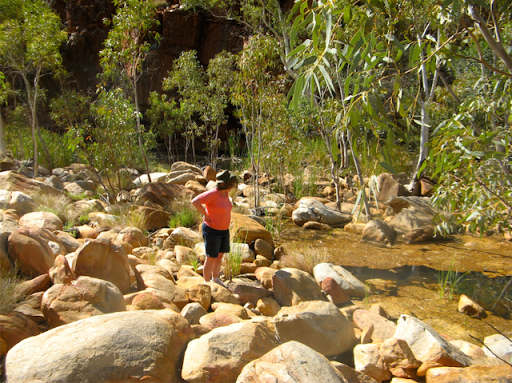 Christmas Pool is a waterhole on a small unnamed creek in the Paterson Range. 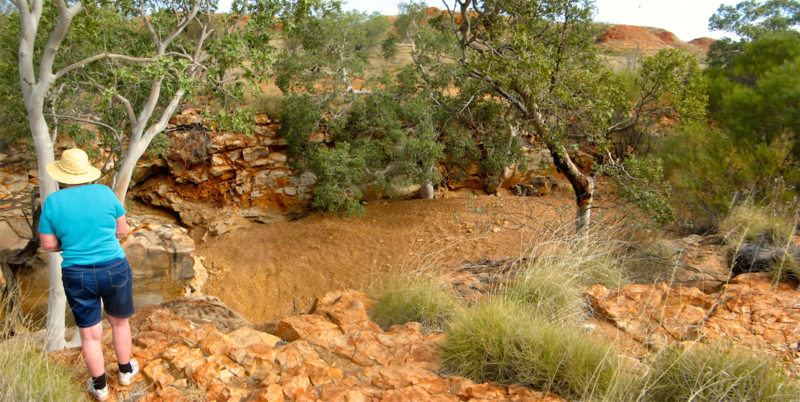 It’s dry at the moment but was used by aboriginals for thousands of years as a wet season meeting place and kitchen. They called it “Wantanmata” and ground the seeds which formed their main diet on the rocks around the waterhole. Their deep grinding marks are still quite visible. The name Christmas Pool was given to the location rather later by William Rudall on 25 December 1896 when he camped here on an expedition to locate the missing members of the Calvert Scientific Expedition. 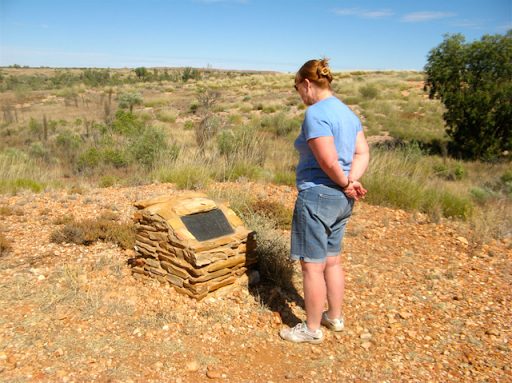 [If you’ve read our report of last year’s crossing of the Great Sandy Desert, yeah right, you’ll recall how we crossed the path of the Calvert Expedition very close to where 2 of his party went missing and whose dessicated bodies were found 6 months later]. The seasonally available fresh water at Wantamata was used by local Aboriginals and early explorers. Nyangumanta people of the Pilbara and Ngulipartu groups occupied the Paterson Range area (Jinwanura) and camped at this waterhole. 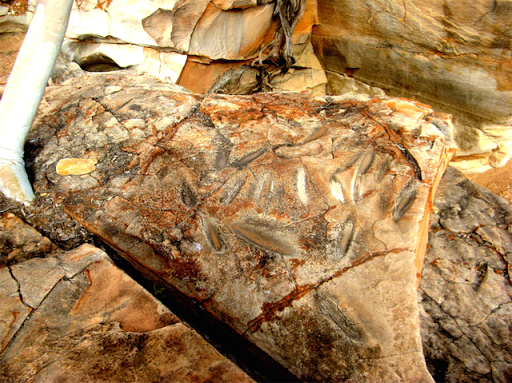 The many grinding grooves in the sandstone bedrock were made by Aboriginal people processing seeds into an edible paste. Seed based foods were a dietary staple in this region. In 1896, William Rudall with his assistants Henry Trotman, Alfred Crofton and Jack Connaughton and Aboriginal guides Cherry and George passed through the Paterson Range while undertaking an expedition to search for the two missing men from the ill-fated Calvert Scientific Expedition. 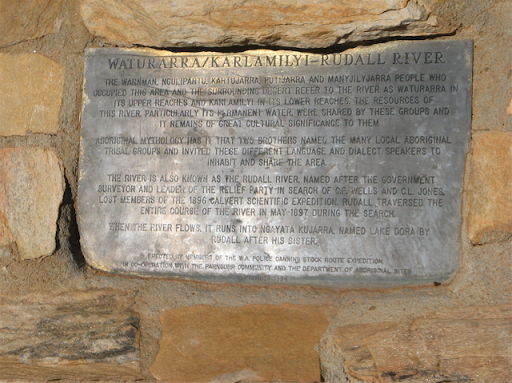 The party used Wantamata as a base camp and Rudall named Christmas Pool when they were here on 25th December 1896. 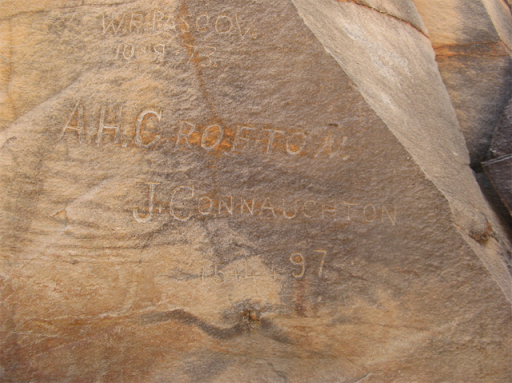 Trotman, Crofton and Connaughton engraved their names and the date into the bedrock. 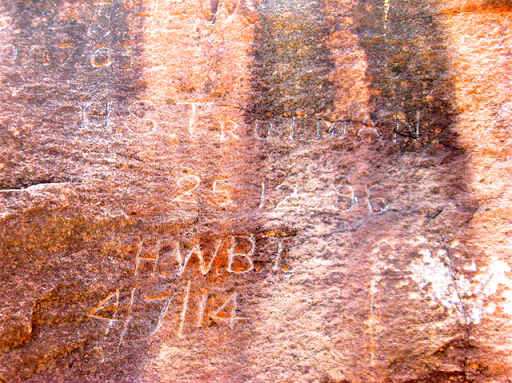 Other early European visitors who left their mark on the rock included government geologist Henry Talbot in 1914 and Jack Mathews, a well known camel team operator and owner of Talawana Station in 1905. Wantamata is a place of national significance which has been managed in order to protect it for the enjoyment of Australians. Refrain from carving names and other messages into the rock. Do not drive beyond the barrier. Avoid cutting and otherwise damaging trees around the site. Take your litter with you when you leave. 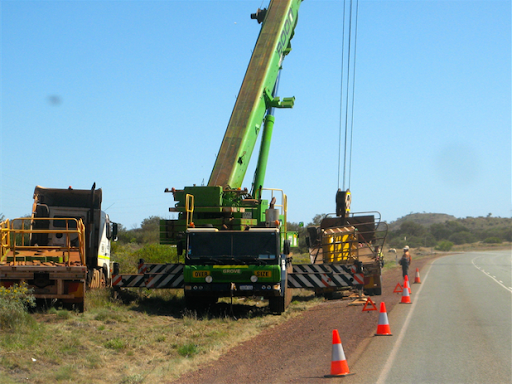 The management work at Wantamata has been undertaken by the Department of Aboriginal Sites and Newcrest Mining 1994. The names of Rudall’s party are all inscribed on the rocks around the pool, all except his own. HS Trottman, Alfred Crofton, Jack Connaughton in 1896/97 and other early explorers, Jack Matthews in 1905 and Henry Talbot (HWBT) in 1914. 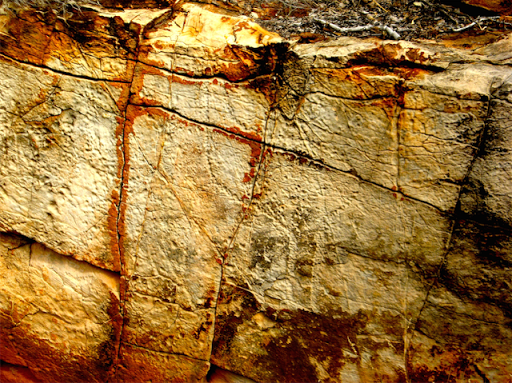 Other later inscriptions are considered as graffiti and most have been obliterated by aboriginal stone chipping. There is also a fairly clear aboriginal stone chipped emu in the rock face but it took a bit of discerning because its head is missing. 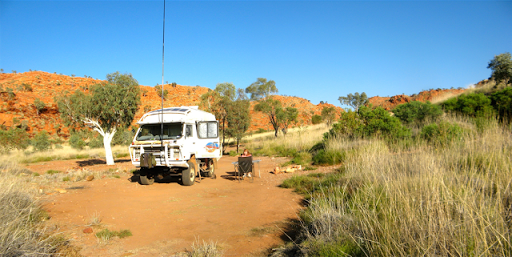 All in all an interesting afternoon, so nice in fact that we’ve camped here tonight in a beautiful valley of red rocky hills covered in spinifex and studded with snappy gums. Tomorrow we’ll move on to Desert Queen Baths, a string of permanent water holes on Rooney Creek in the Broadhurst Range of hills. A cloudy day, bugga it, now I’ll have to reset my cloudless day counter. A warm but pretty drive south from our Christmas Pool campsite past Moses Chair, a large round but otherwise featureless hill. Looks more like a beanbag than a chair. One can only conjecture about its name, maybe it’s reminiscent of Mt Sinai, “an arid mountain in NE Egypt”, where it is supposed Moses received the Ten Commandments, several years before Charlton Heston made them popular. Whilst pretty, the track south was very annoyingly corrugated. 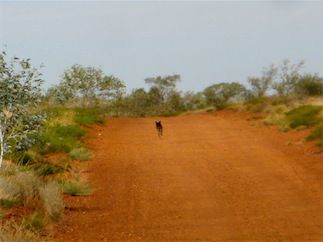 However a black dingo ran in down the track in front of us for 10 minutes, faster than we could drive (5km), before deciding the sharp spinifex was less annoying than the big white vehicle following it. Quite a feat of endurance in this hot dry climate. 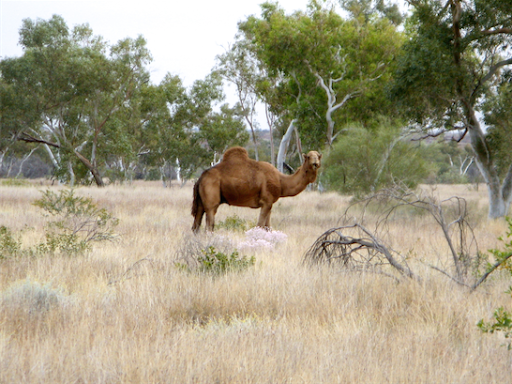 We also disturbed a large brown camel which eventually wandered off the track and bellowed at our inconsideration, and several clumps of pretty flowers making use of the recently burnt out landscape. 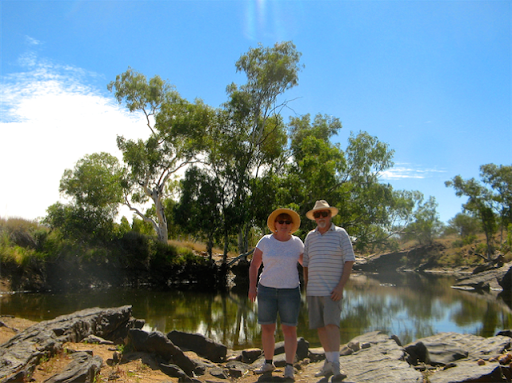 A small wheel track of to the right caught our attention so we investigated and discovered Coolbro Creek waterhole, a permanent oasis for wild life in an arid environment. After we’d investigated and recorded the waterhole, 2 vehicles arrived and disgorged 4 birdie people, all strung about with cameras and binoculars and talking about Princess Parrots and Red Backed Kingfishers and had we seen any etc. We chatted for a while and then us “novices” as they unkindly referred to us as, left them to explore and catalog the birdlife. 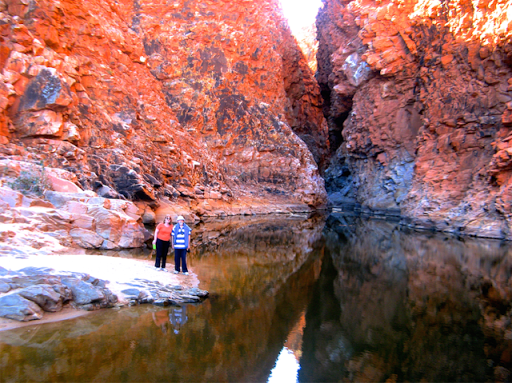 Further on we turned down a narrow track to Desert Queen Baths (DQB), a series of waterholes in the Rooney Creek, and one of the magical places in the NP. The track is only 18km but is guarded by a severe warning of difficulties ahead, unmaintained, major wash-aways, narrow, rough and steep. And so it was, all of those things. Thrice I had to stop and walk ahead to select the least risky path for our Oka, and once we had to clear some large rocks from the side of the track so I could deviate around a steep wash-away to avoid the risk of a roll-over. No one here when we arrived, but our birdie friends and 2 other camper trailers arrived just before dark, but still a very scenic and peaceful place nontheless. “Never get between the door and a woman’s full bladder”. 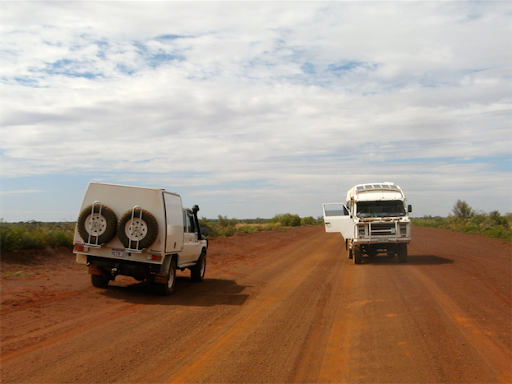 This was one of the risks of outback travel I learned early this morning but hadn’t previously considered. It certainly shouldn’t be underestimated. After an outdoor breakfast of eggs, bacon and fried potato, we packed a small lunch, lots of water, the camera, a GPS and fly hats and set out on a trek to the waterholes. Nature has an annoying habit of making the best places the most difficult to access, and these waterholes are no exception. 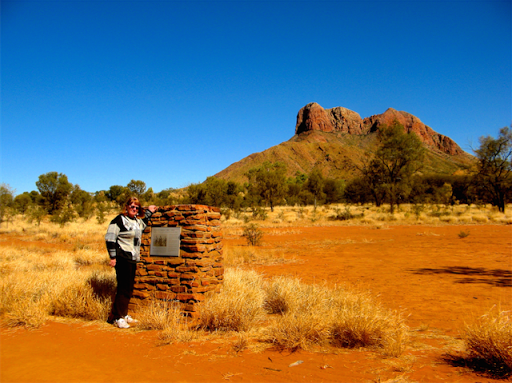 In 4 hours we managed to rock-hop/scramble our way to 4 waterholes, a total distance of 3.5 km. There are a lot more water holes around but they are too difficult to access without a helicopter. When we did the walk last time, in 2007, we only went half this distance, stopping for lunch on what we called Apricot Rock, since we found a piece of dried apricot on it. This time the apricot was no longer there but there was some orange peel, so we carried on to a more salubrious rock. In one pool we saw a few small ducks with yellow flashes under their eyes and reddish brown necks. Consulting our bird book later revealed no conclusive identification but we suspect it’s an Australasia Grebe in mating colours. It was a hot, knee/ankle wrecking walk and not without its risks, we had a few near misses and got a bit lost on our way back (every rock looks like every other one and you don’t leave footprints on rocks to follow), and when we got back everything was hot, aching and/or needing TLC. The afternoon was spent recuperating in the shade with some cool drinks. Brilliant sunny day after a cool clear night. After the extravagant exoticnesses of yesterday’s bacon and eggs, it’s back to Weet-Bix today. Before leaving I cleaned out the dust and dirt from one of the window channels so we can now at least open one rear window. Next week I might try another one. The drive out of DQB was, not surprisingly, just as tortuous as the way in and the track south was just as corrugated. We passed perky miss Compton’s Pinnacle. Near the Rudall River crossing we turned up a track for lunch at No 11 Pool, where we met a couple of former Kiwi’s (Sean and Hillary) in a dark green Land Rover TDi Defender. Later we met again at Tjingkulatjatjarra Pool where they are camped near the waterhole and they saw what was probably a Black Snake hunting at the water’s edge. But Black Snakes come in various colour schemes and Hilary’s photo showed a snake with half orange, half green body with a black head. For black snakes, obvious cross hatching of scales is a better identifier than colour. Either way they are not to be trifled with, they’re very dangerous and we are very remote from any antivenom supplies. We are camped higher up on the river bank, which is not so nice, but in a snake free zone. Immediate Pressure Immobilisation Bandaging (tight like for a sprained ankle) over as much as possible of the affected limb starting with the bite area, with complete movement prevention, is the ONLY successful method of slowing the spread of envenomation while urgent medical assistance is sought (brought to the patient preferably, not vice versa). Later in the afternoon, we enjoyed a couple of hours chatting with S&H over a few drinks about travel in Oz and in the Middle East and India. Ducks in this pool were more easily identified than in DQB and confirmed our earlier siting as Australasian Grebes. 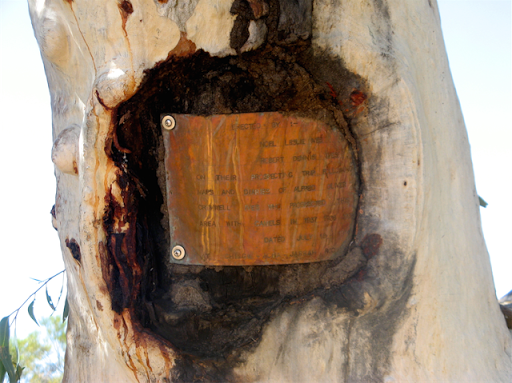 A plaque on a tree next to the pool describes the 1974 travels of the Ives brothers in this area following the explorations of (probably) their father in the late 30’s. Travel in Australia in pre-war days would have been very difficult since up to 1940, only 2% of Australia had been formally mapped, mostly the east coast. The war accelerated this process but it still took another 20 years before the whole country was adequately mapped by completion of the Australian Geodetic Survey program which ran from 1951 to 1965 and incorporated the survey work undertaken during Len Beadell’s road construction network. Another glorious sunny day at Tching-kula-tja-tjarra Pool, which is exactly how it’s pronouciated. I called in to Alice Springs base and actually pronounciated it that way with some conviction and the base operator actually knew where I meant. It’s commonly referred to as “T-Pool” amongst commoner folk. All up and breakfasted before 7am, only 6 hours ‘till lunchtime! It’s a nice place and tempting to stay here another day but all that does is use up resources for no progress, so it’s southwards towards the Talawana Track today. S&H left heading towards Marble Bar and then Ningaloo and we agreed we might meet them somewhere down the track or at Ningaloo. We drove up a nearby hill to see the view but the southern part of the park is nothing like as scenic as the northern section so I’m glad we came in from that direction this time. When we stopped, with a bump, I found this large orange boulder (which I've moved) wedged in front the rear wheel, causing the “bump”. How I missed it with the front wheel is a mystery. 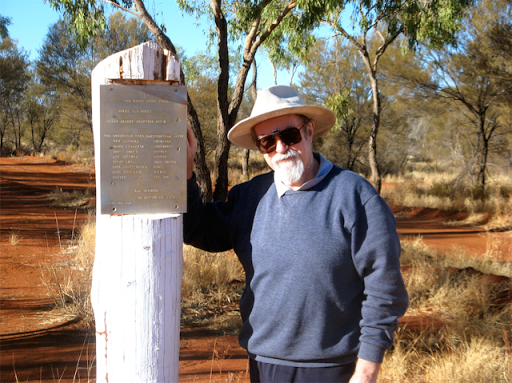 We backtracked from T-Pool to the main track which was quite a difficult little 8km and crossed the actual (but dry) Rudall River after stopping to re-read the plaque. It hasn’t changed since 2007. We thought that Kalkan Kalkan Soak sounded interesting but we were disappointed, no water and a tricky little manoeuvre needed after I went a bit too far into the river gravel. However I extracted ourselves with a bit of to-ing and fro-ing and returned to the main track. It might be called the “Main Track” but the next 50km was very corrugated sand and the best we could do without shaking J’s bra off was 20kph. We stopped for lunch in the only nice spot on the track. Eventually we turned right on to the Talalwana Track, which is a very wide gravelly/sandy track where even 70kph wasn’t out of the question. We went looking for a superb campsite we found in 2007 after the Oka engine just stopped near here, due to a wiring problem. No such problem this time round, but neither did we find the same camping spot. Instead we located a small track and very nice campsite under a few small Desert Oak trees. We had a campfire to burn our burnable rubbish and cooked sausages and beans on the red hot coals (in a dutch oven of course, we're not cave persons! ), which we consumed in conjunction with Serge’s home made red wine. Outback decadence. Later we watched the stars through our nick-nocs and put the Hubble space telescope to shame with our astronomical observations. “Ooh, is that a comet?”, “No just an aeroplane”. “Why is the Southern Cross lying on it’s side?”. No answer was forthcoming to that one so we went inside to do the dishes instead. 19 August 2015 our 43rd wedding anniversary. Beautiful pink sunny start to the day. Finally refitted a fly screen to the window previously de-gritted so we can not only open it but also keep out flying insects, which are becoming more plethoric as we head more northerly. While doing so, a large buzzy fly came in and now of course can’t get out. How bloody ironic. a large buzzy fly came in and now of course can’t get out. The rest of the drive along the Talawana Track was pretty ho-hum, through cattle stations and soft boggy muddy semi-desert. 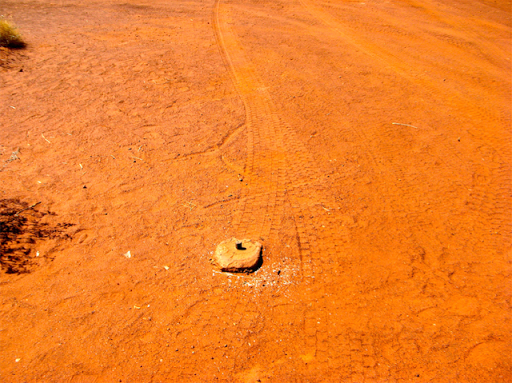 Balfour Downs and Ethel Creek Stations, both we suspect are indigenous owned due to the number of abandoned and rusting car wrecks along the trackside. 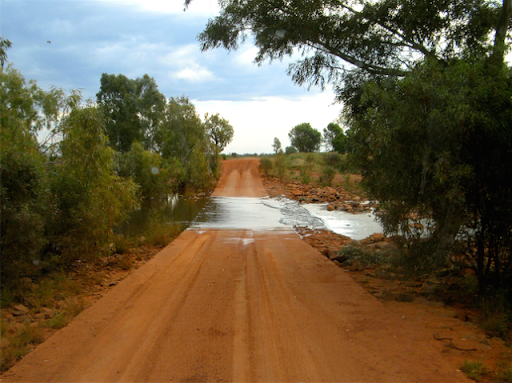 We splashed across Fortescue Creek, the first time in 3700km we've got our feet wet. Fortunately, in some ways, there were no rest areas and even small tracks we could pull off into to camp. 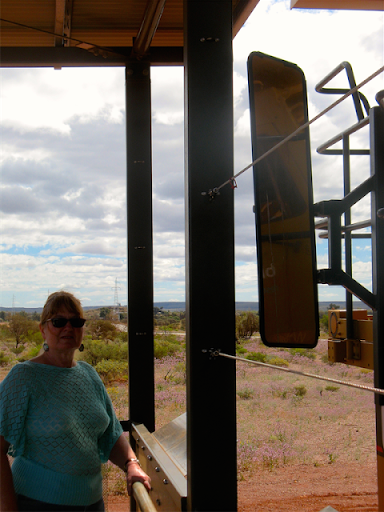 So we reached the Newman to Marble Bar highway late and tired but happily there was a rest area in a beautiful area of bushland just opposite the junction, and if you ignored the wrecked cars, broken bottles and assorted recycling that wasn’t, it was quite a nice place to stop. You can just see a wrecked car on the left under the tree. A beautiful scented aroma entered the Oka for most of the night through our newly fitted fly screen from the plethora of native shrubs that are all in bloom, mauve Mulla Mullas, yellow Wattle and purple Solanum flowers. Silver glints from dumped VB cans, and brown are the cars’ rusting groans. Words-bloody-worth, eat your heart out. 'Twas but a 50km stones's throw to Newman by carriage and pair where a Laundromat was sought, unsuccessfully, so we booked into a caravan park for $26 (inc. oldies discount) to get the washing done, fill with water legally etc. etc. Newman is BHP Billiton's main iron ore mine site and the location of the largest open cut mine in the world, 5km long, 1.5km wide and deep enough to fill quite a few olympic sized swimming pools and/or land some jumbo jets. 3.7 tonnes per tyre, times 4, equals a lot of rubber. 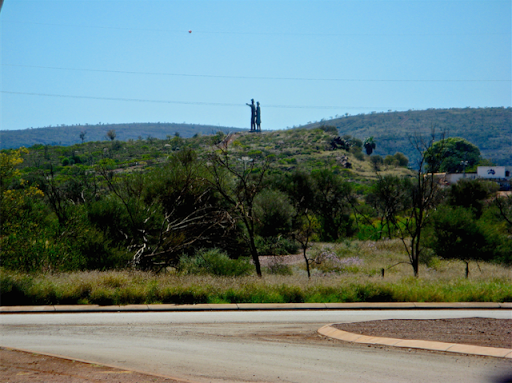 On a hilltop outside the town are a couple of huge steel statues of a man and a woman, seemingly holding on to the 220kv power lines. The washing washed the shopping shopped, emails read, cricket watched, calls made to relies all, water and gas supplies satisfied and tanks refilled (with 8ç/l off if I bought 2 Mars Bars, no contest), we sallied forth north from Newman. On the way we came across this recovery process. 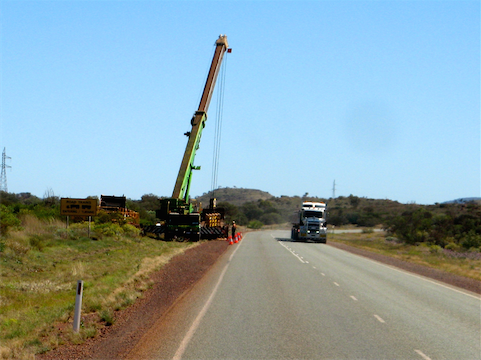 A trailer had become detached from its prime mover and its load was being removed prior to truck recovery. From the size of the crane it was a very heavy load. We reached the Mt Robinson Rest Area in mid afternoon and here we shall stay tonight, quite a picturesque location at the foot of Mt Robinson, surprisingly enough. Later that morning on the Talawana Track we came across a mystery. This almost new Toyota was seemingly abandoned on the side of the track. 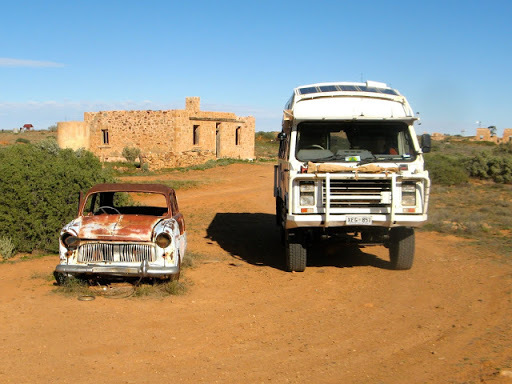 It’s not unusual to see abandoned vehicles in Aboriginal areas, when their cars break down they just leave them to rust away and go and get another one. But this didn’t look like an aboriginal vehicle, it was too new and clean. So we stopped and approached it cautiously in case it was some sort of Peter Falconio type axe-murderer scam, but the ute was deserted. I carefully checked but there no one was inside and all the doors were locked, so we scouted around in case someone had gone behind a bush, or bird-spotting or what ever, but there was no trace of anyone and there were only only a couple of footprints outside the drivers door leading nowhere. How strange? I took some more photos with the intention of telling the police about it when we reached Newman the next day, and drove on. An hour or so later we came across another similar vehicle parked on the side of the road, but this time there was a man standing by the driver’s door and someone in the passenger’s seat. Whoa! What’s going on here??? This is a very remote and lonely track and it was all getting slightly scary. Scary moment on a lonely track. The man flagged us down as we approached and being suspicious we stopped short of him and waited for him to approach us. He was a dark coloured man who I initially thought was aboriginal but turned out to be African, neatly dressed and well spoken. I lowered the window and he said he was lost. He only had a simple hand drawn paper map and was trying to locate Parnagurr, a small Aboriginal community about 150km up the track we had come from. But why 2 vehicles and one abandoned? Kiki with his “navigation” system. It seems they had both come from Newman, 300km away, in separate vehicles. The passenger, also an African lady in full African dress and holding a Sat Phone, was heading for Parngurr. 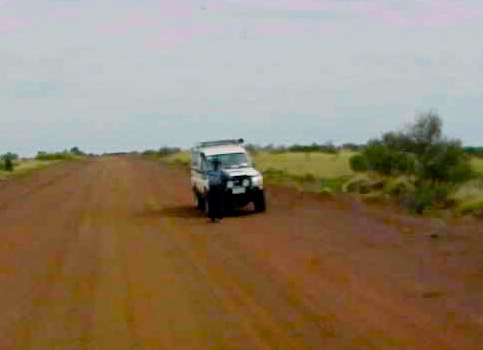 The man was escorting her as far as the Jigalong track junction after which he would return to Newman and she would continue to Parngurr alone. But they had missed the junction which was very small and had no signposts, so they had taken one vehicle and returned to look for it, to ensure they were on the right track, leaving the other vehicle, which we found. Not finding the junction for a second time they stopped and waited, as it happens, for us to come along. We showed the man (Kiki was his name) where we were and where Parngurr was on our map system but it took some time for him to grasp the geography of the area. Eventually he was happy that he knew where they were and where to go and we left them to continue their journey(s). Navigation all sorted out and they were sent on their way. 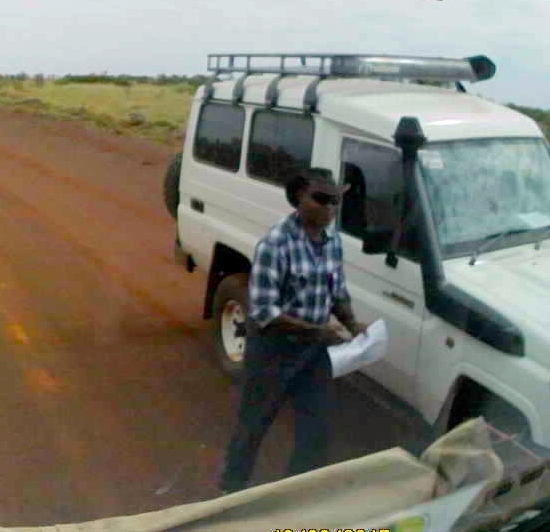 So the mystery was cleared up, but it still struck us as very strange that 2 African people who were obviously new to Australia should be driving around the outback, alone and in new vehicles, unsure of where they were, with inadequate maps and heading for an Aboriginal community. But for what purpose? We never saw them again so we assume Kiki escorted the lady all the way to Parngurr (more than 400km from Newman) rather than return early. Australia is certainly a strange place.